The original Greek name for Italy was Oenotria meaning “wine country.” Its modern name “Italy” seems to come from a legendary king of the Oenotrians called Italos/Italus. 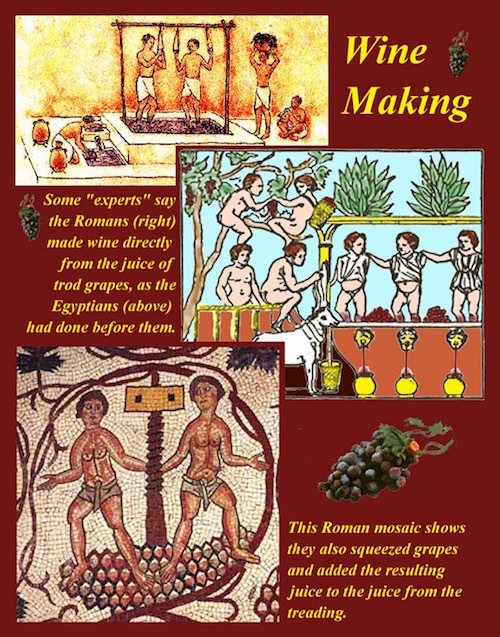 Wine and winemaking has been around for thousands of years. In 2001 a wine press was unearthed in Armenia with red wine dated to be 6,100 years old. 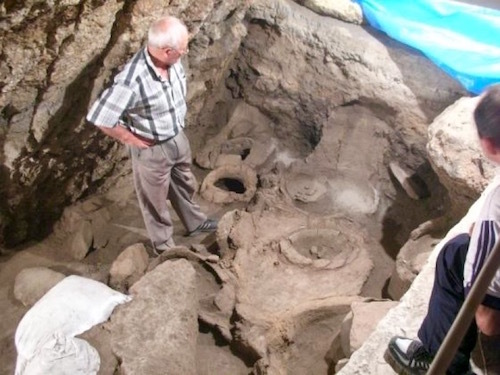 Archeologist Levon Petrosyan looks at 6,001 year-old wine making equipment found in Armenia. CLICK HERE for article about The World’s Oldest Shoe (found, also, with this oldest wine-making equipment). 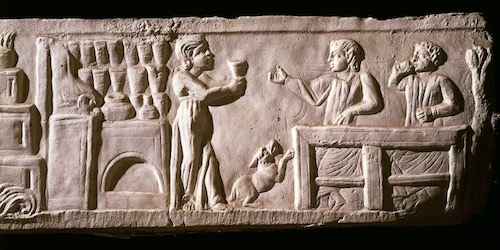 By the end of the 2nd century BC, the Romans had perfected viticulture and winemaking. The basic winepress consisted of an upper vat where the grapes were trodden with bare feet and a deeper lower vat to receive the juices. Bacchus, the god of wine, was one of the most popular of the Roman gods, as was Dionysius, the god of wine, among the Greeks. In order to get all the juices out, the grape husks were pressed down by a wooden plank covered with heavy stones. More sophisticated winepresses have been found with three or four vats to refine and reduce the amount of sediment in the wine. The juice fermented in the lowest vat for about a week and then was poured into wineskins or jars called amphorae for two to four months when the normal fermentation process was complete. 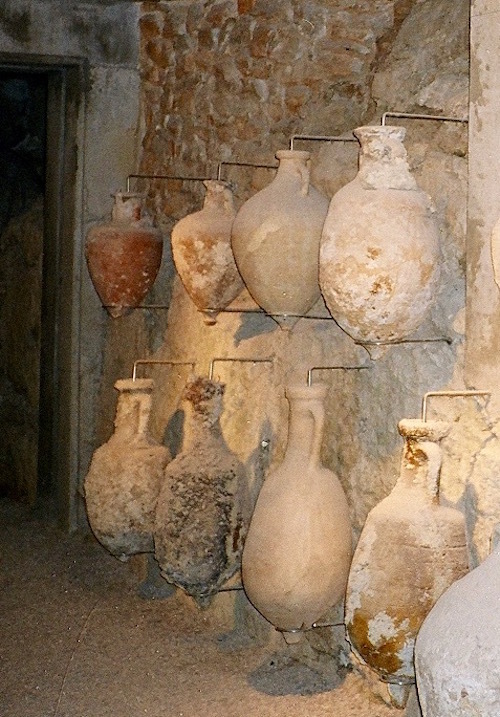 After fermentation, the wine was stored in amphorae for aging or for serving. Wines were graded and priced according to the grapes used and the location of the vineyards. 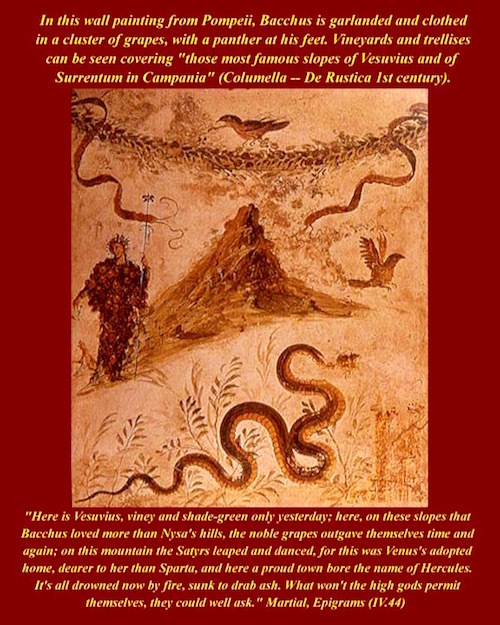 The fabled Falernian wine, grown from imported Greek grape vines at Cumae in the Bay of Naples, was the most expensive wine and could withstand aging up to 150 years. It was a white wine, normally aged 10-20 years until it was amber-colored. The daily drink of Romans was a plebeian red wine not more than a year old. Most wines were bottled in 100-gallon amphorae that were sealed and labeled. Romans, following the Greek tradition, considered it barbaric and provincial to drink undiluted wine. Even though they had a profitable trade with Gaul (France and environs) exchanging wine for slaves, the Romans looked down on the Gauls as a besotted people because they drank their wine undiluted. The Romans mixed one part wine to two parts water. The Greeks diluted their wine with three-four parts water. When the early Christians talk of using “mingled wine” in Communion, they are meaning wine diluted with water. 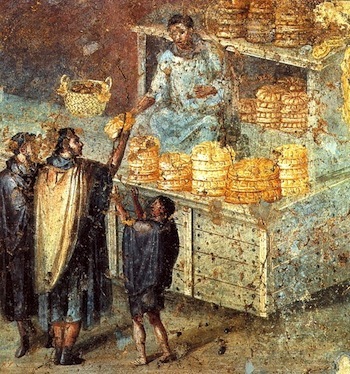 Mulsum was wine sweetened by honey. 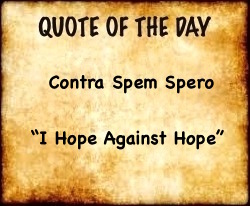 Conditum was wine to which herbs, spices and pepper were added. Mixed wines had a number of applications. Wine mixed with barley made a good household vinegar. The wine blended with myrrh offered to and turned down by Jesus on the cross in Mark 15:23 was used as an anesthetic. 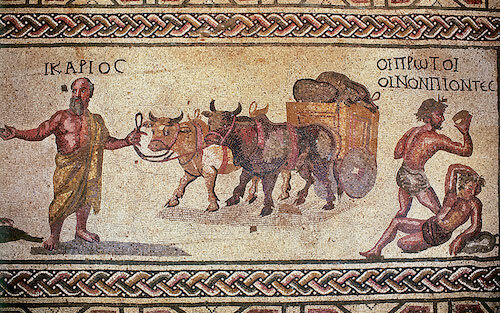 In Paphos, Cyprus a floor mosaic from the 200’s AD has been found in an antique villa (see below). Called The First Wine Drinkers, it recalls the mythological story of Ikarios from Athens who was kind to the god Dionysius. As a reward, Dionysius gave him the gift of wine which Ikarios gave to his shepherds. 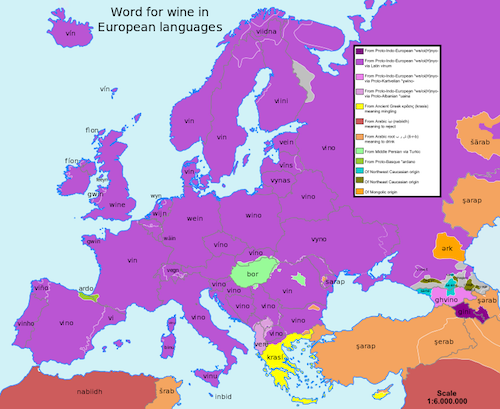 The word for “wine” in European languages. Most are taken from the Latin name for wine: vinum.